The first dish we look at is the Po’ boy this is dish you will find in various diners in the USA and has its roots in Louisiana dating all the way back to the 1930’s. Now traditionally a Po’ Boy is fried meat or fish on a baguette style bread. This one is different in that it is a series of 3 mini breads with fried oyster. The dish is flanked with a tomato gazpacho in a shot glass and a lemon half. 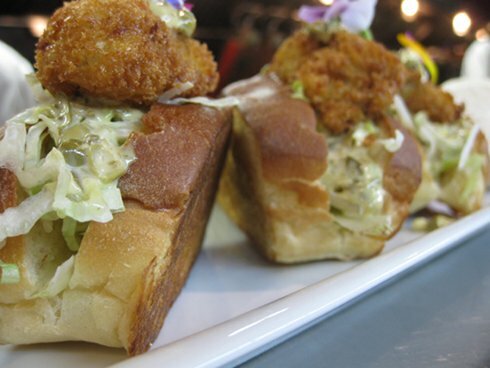 The bread used is a mini broche roll filled with oysters, iceberg chiffonade and topped with remoulade sauce. The oysters are breaded then deep-fried and their size is quite plump and you get one per Po’ boy. This dish is planned to be an entrée and each bite of these is loaded with flavour and pop in your mouth as you eat it. What makes this dish fun is that it takes oysters and brings them brunch, initially they wanted to have an oyster bar but the issue is that if it is not a popular item there is a waste of oysters since it needs to be fresh. This dish is a way of still giving you oysters but in a more filling and more fun manner. Remember not everyone is a fan of oysters and not everyone is ready to have them in the morning. Now having focused on something fried I feel I should showcase something lighter and healthy. I recall when discussing the menu ideas months ago, the issue of something for vegetarians came up. A tasty and creative vegetarian option is something that you do not find often. 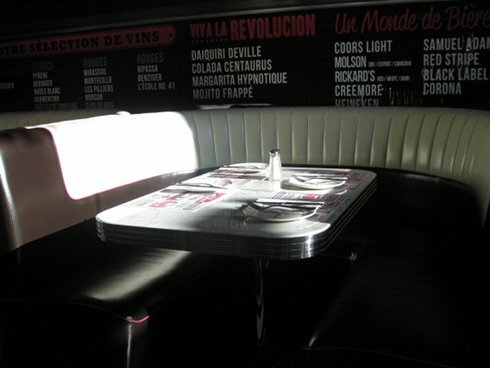 I mean many restaurants have a vegetarian option but it is often bland and uninspired. One salad we saw draws its inspiration from a Greek salad but has some other ingredients added to it which make it the surprise dish of the day. 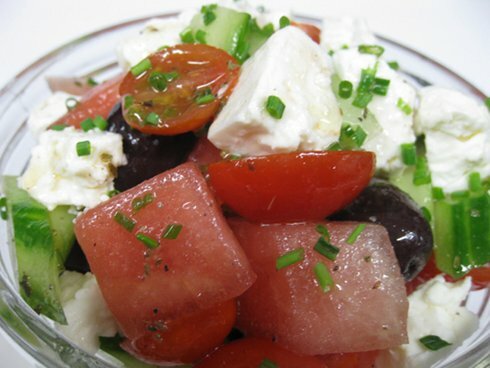 This dish has loads of feta cheese, olives, cucumbers, fresh herbs and watermelons. It has surprised everyone who tried it; it is light and refreshing while still offering you the robust flavour of lots of feta and by lots I really mean it. The feta portion is extremely generous, and this dish can be enjoyed all year long but it is absolutely perfect on a nice summer day because it is refreshing and you get large portion so you will definitely be full. 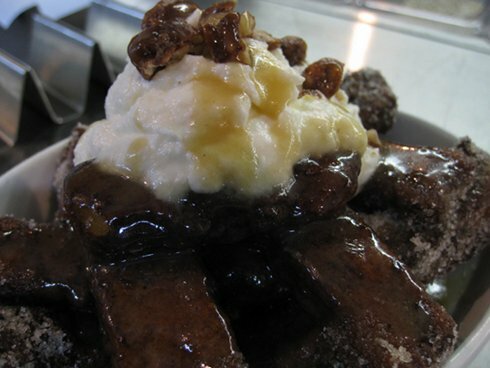 So now that we have two dishes I feel like I should leave you with a dessert dish. Well to be honest it’s a sweet dish but not exactly dessert. These are 2 things that you would never expect to go well together. That’s right breakfast poutine. I almost all but gave up having a breakfast poutine at various places that have it since I always get disappointed and I realized why. It’s because most places just serve you poutine for breakfast and not a breakfast poutine. The difference is that potatoes and gravy are not intended at 10 am, but people do like poutine in general. So Deville surprised me with a French toast poutine. What you have are thick french toast slices made from brioche bread cut the same as julienne fries, stacked like a poutine and drizzled with a syrup instead of gravy this dish is also topped with ricotta cheese and some pistachios. This isn’t thinking outside the box it’s looking at the box from across the street. The only thing that made me happier than that is that there is finally a breakfast poutine that tastes good in Montreal which was a fun and great sweet dish. Over the next few posts you will see that the sweet dishes have some really creative stuff that you kind of thought of as a kid but never could do. So keep this in mind when you come, and you can likely share it with others as well if you are a group. So with that in mind I wish you bon appétit and check us out for our next post.